Can a casserole be considered creative? I say, if it renders everyone a) speechless or b) leaves them only able to mutter “mms” and other yummy sounds, it can be! This is such a casserole. Simple ingredients, easily thrown together at the end of a long and busy day, that results in yummy noises and a happy, full, family. Add some freshly ground black pepper and a teensy bit of kosher salt (careful with the salt!). Sprinkle about a teaspoon of dehydrated onion flakes over the hash browns. To the beaten eggs, add a cup of cheese (or a handful.. or as much as you’d like.. or need.. or are limited to) and blend. Add your peppers and tomatoes. Pour the egg mixture over the hash browns. Top with the cooked and sliced sausages, spreading the pieces evenly over the casserole. Don’t be concerned if it seems like the eggs have vanished because they will fluff/rise up nicely while the casserole bakes for the next 30-45 minutes in the middle of your preheated oven. I use my nose and my eyes a lot in my kitchen. When it starts to smell like supper, you’ll know you are almost there. When the hash browns are browning (Hello! They’re hash browns.) on the bottom of the pan (score one for the see through glass pan!) it’s time to turn the oven off. Allow it to cool a little bit, and while it does, the kids can help set the table, so *everyone* gets to sit down to a scrumptious, simple supper – together. 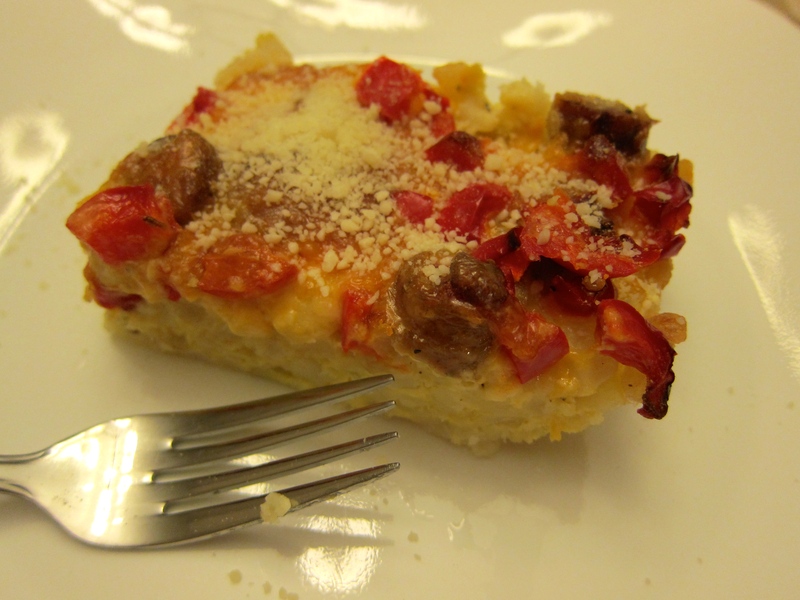 Are you pro casserole or do you prefer your foods stick to their separate quarters on your plate? Leave a comment and tell me about one of your creations that just works. Oh, and if you try this let me know what you think of it!